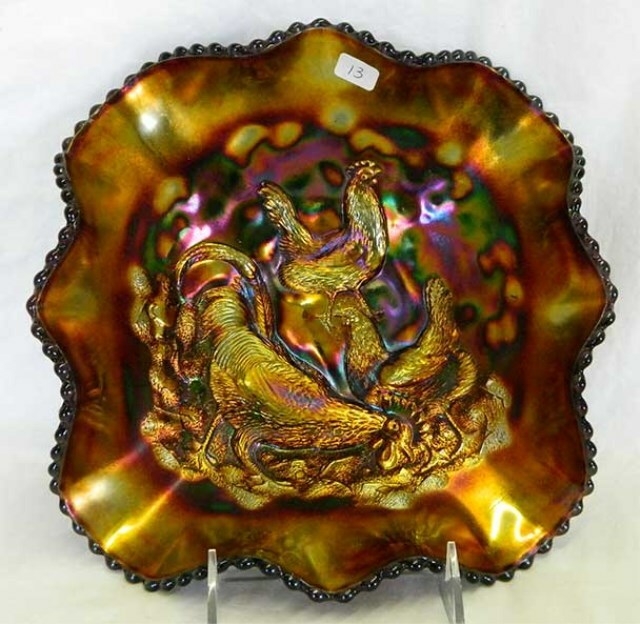 Dugan's Farmyard is one of the most desirable pieces in the Carnival pantheon. 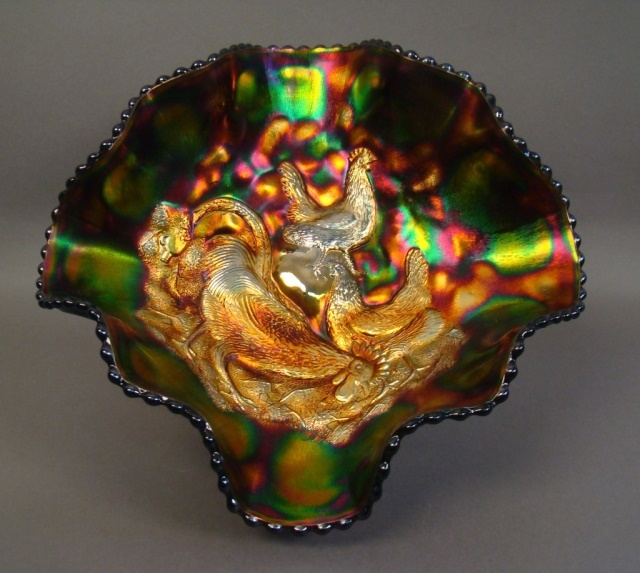 Despite their desirability, there are quite a few pieces around. 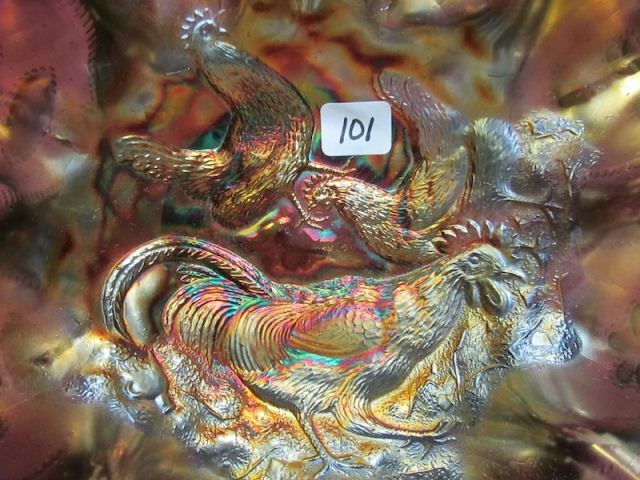 More than 70 listed in the database of auction sales over the last 12 years. 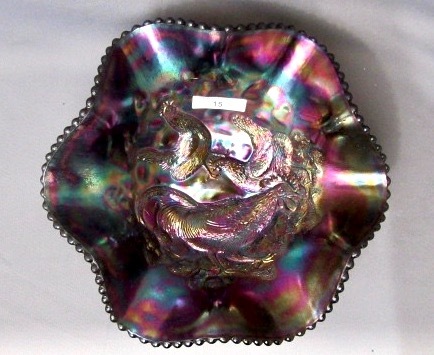 Mostly seen in purple with a 6-ruffled edge; those with an 8 ruffles, as shown above left, are less often seen. 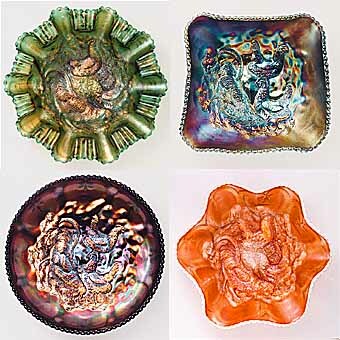 Above right are some of the rarities in the pattern: Bowls in three-in-one green, a square purple (they are also ruffled in a squarish shape), a low bowl–almost a plate–in purple, and the only known peach opal example. 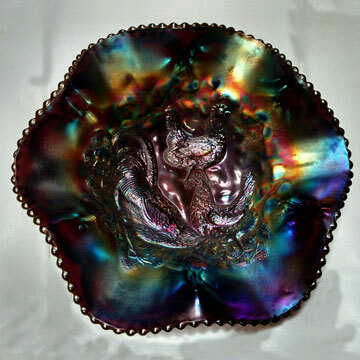 All have Dugan's Jeweled Heart exterior. 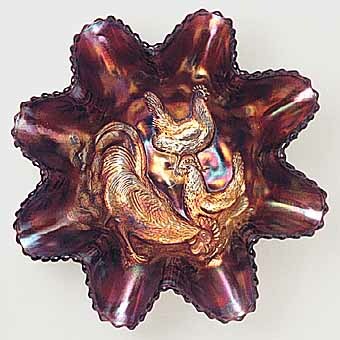 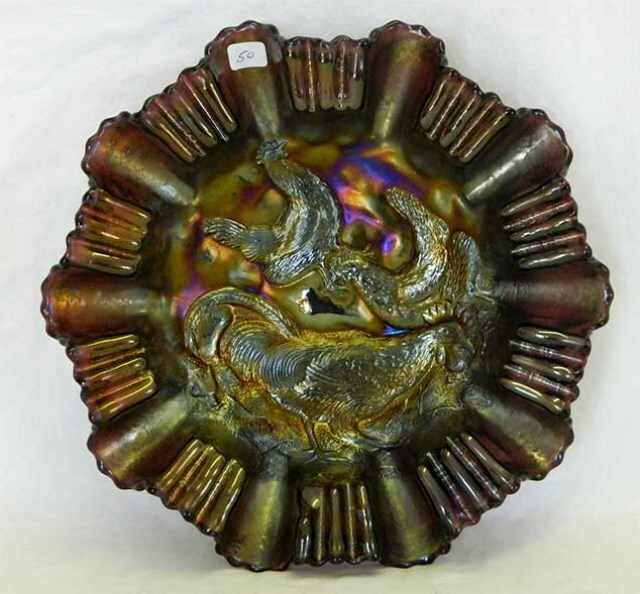 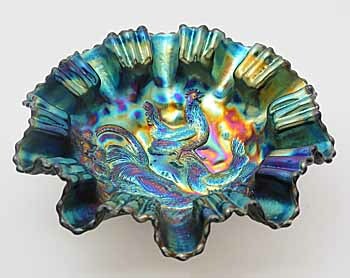 The pattern has been reproduced in chop plates, bowls, rosebowls, and spittoons in modern colors. 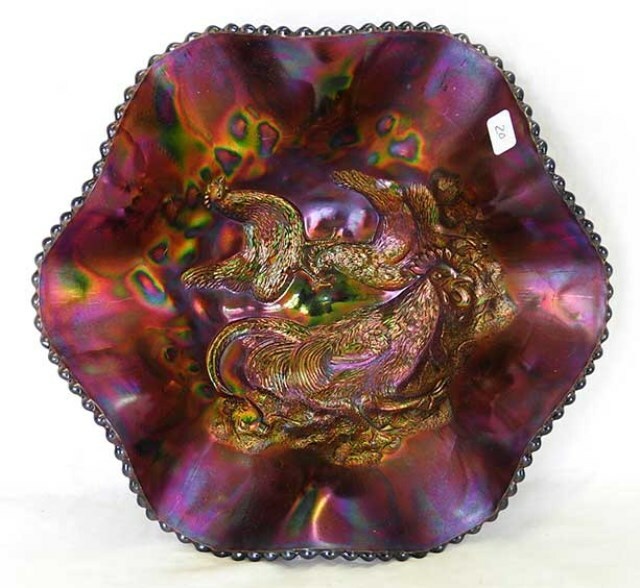 Above on the left, a rare three-in-one edged bowl in purple brought $8,000 at the 2002 ICGA convention auction. 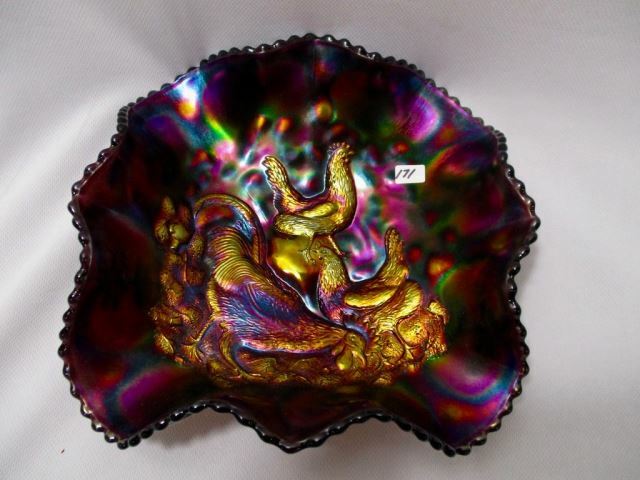 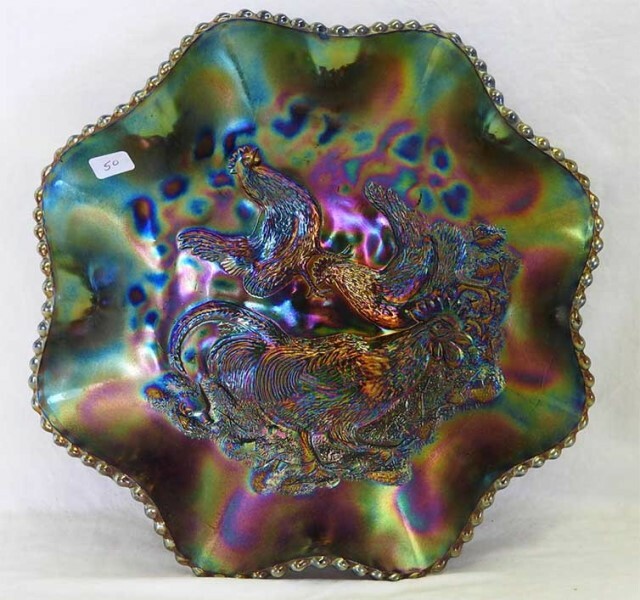 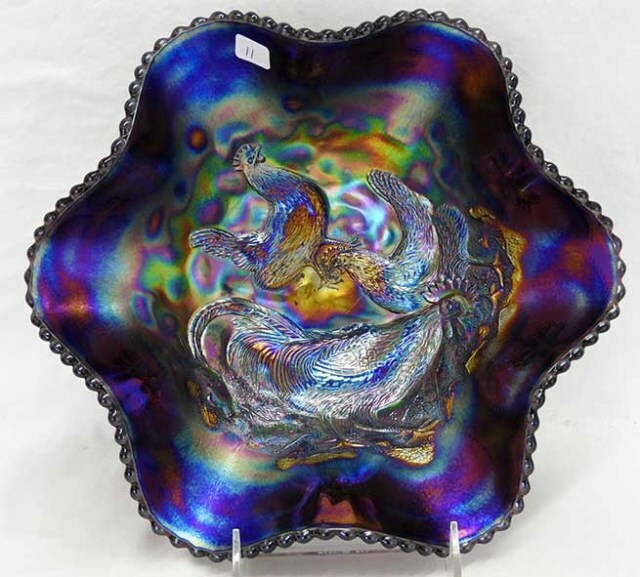 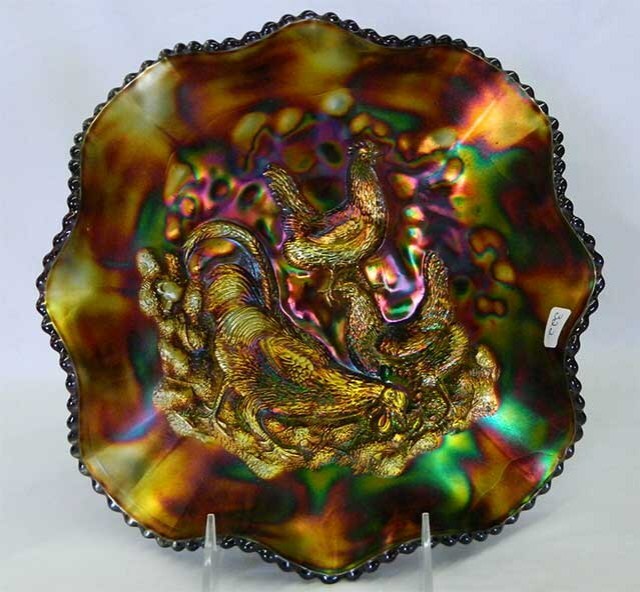 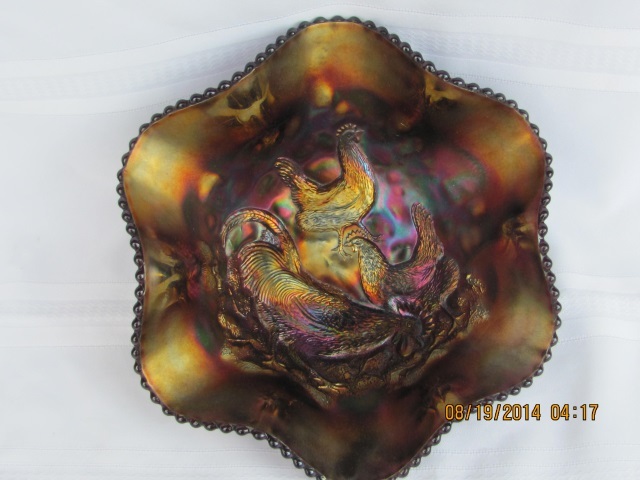 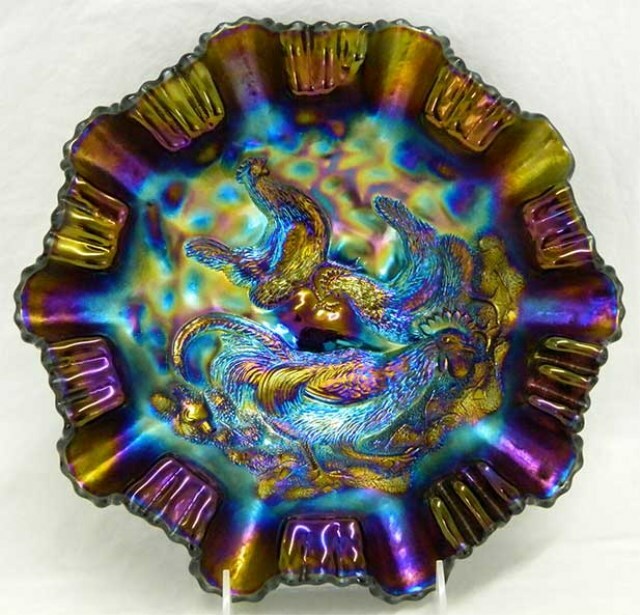 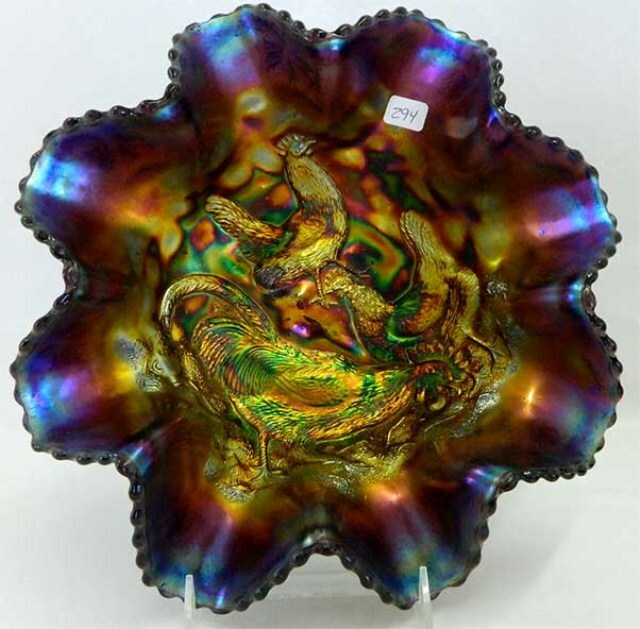 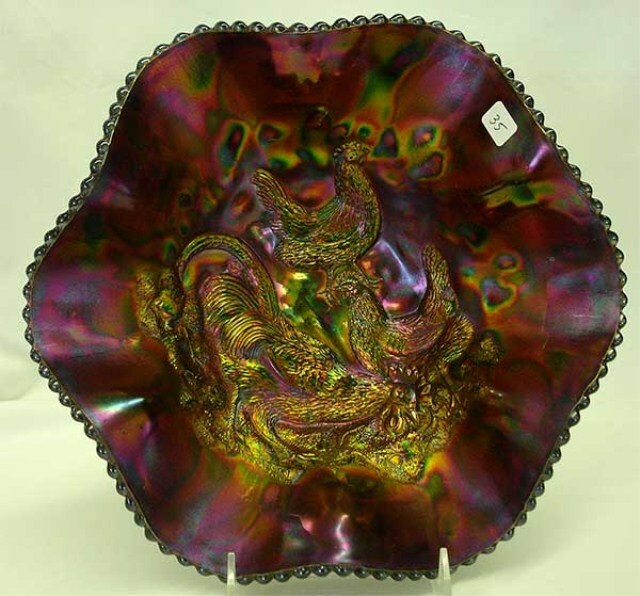 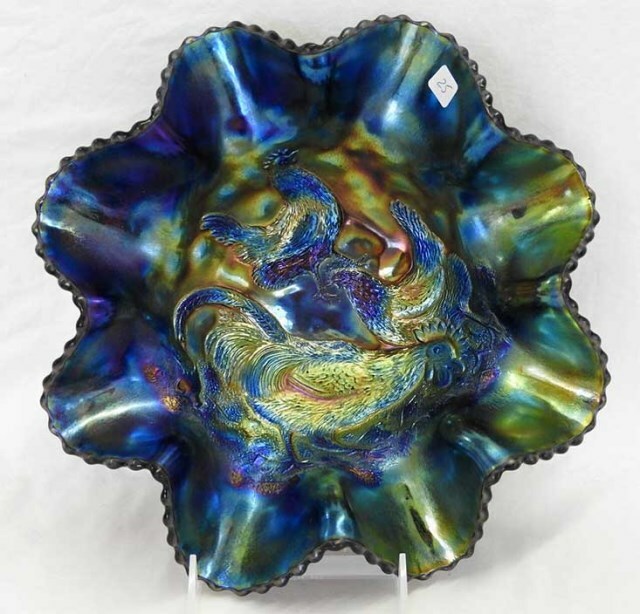 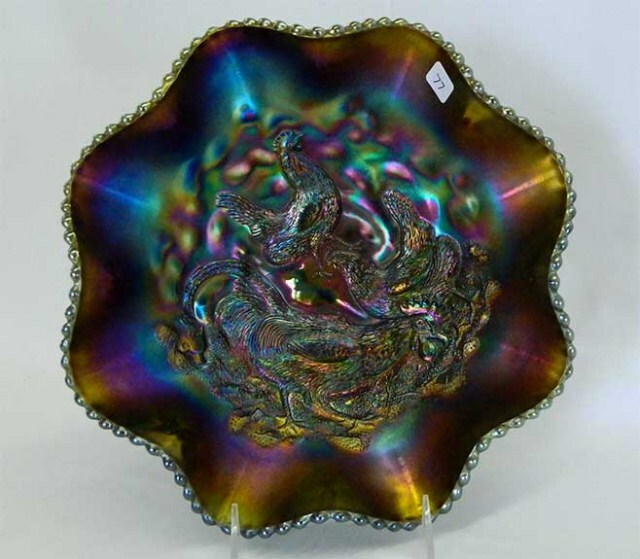 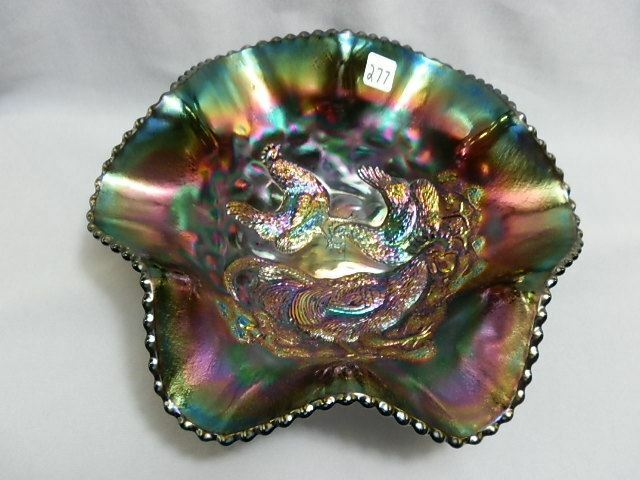 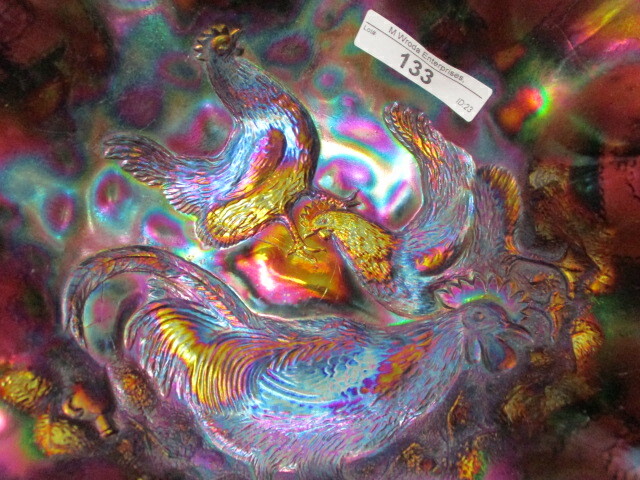 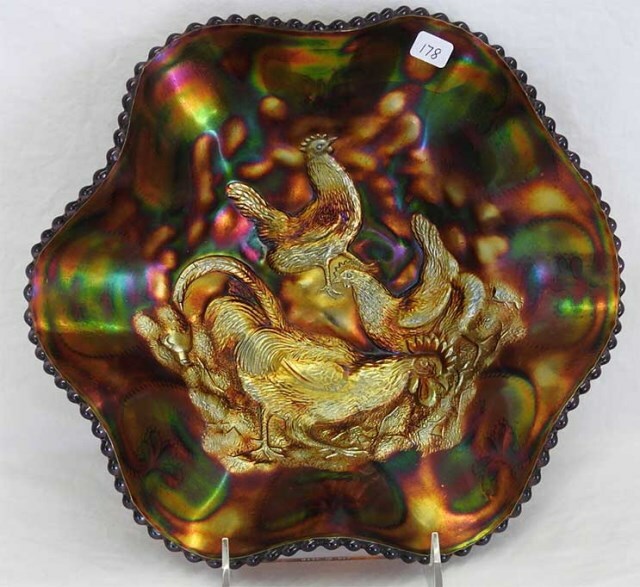 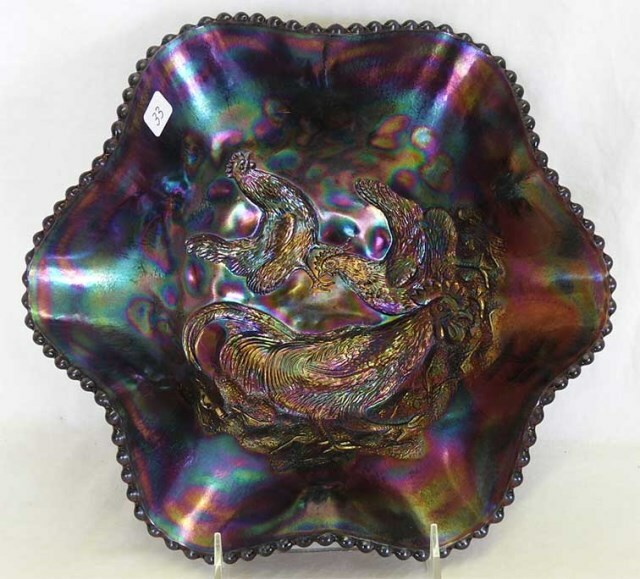 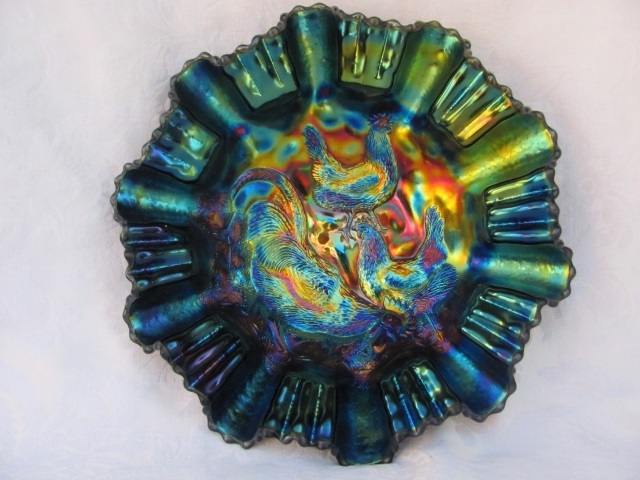 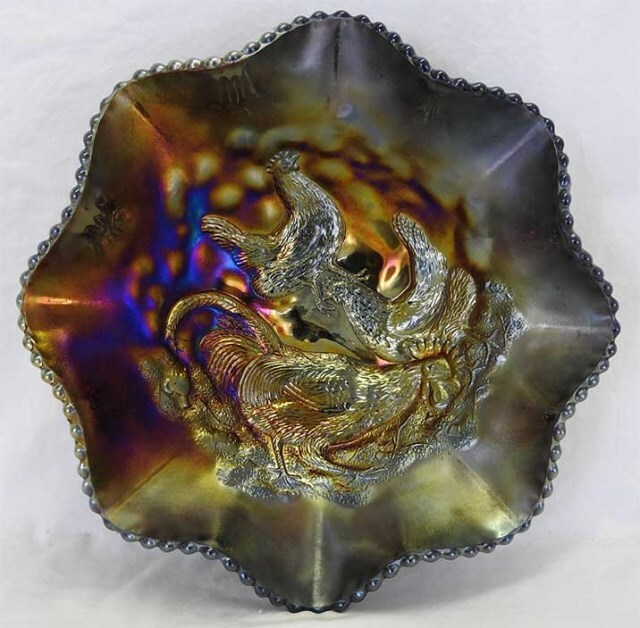 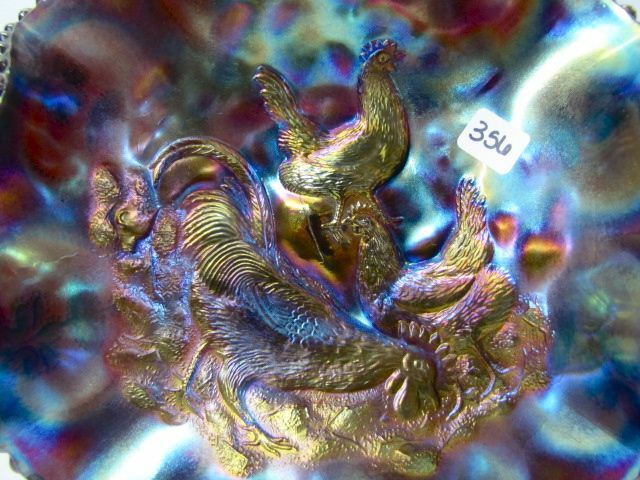 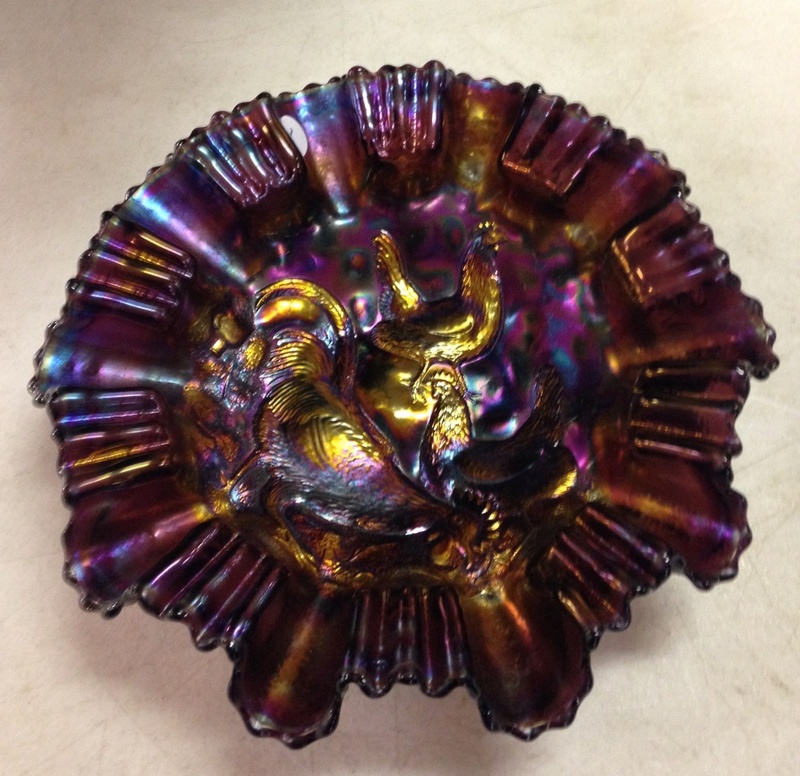 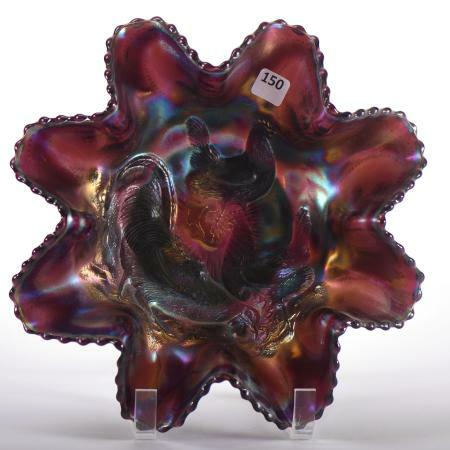 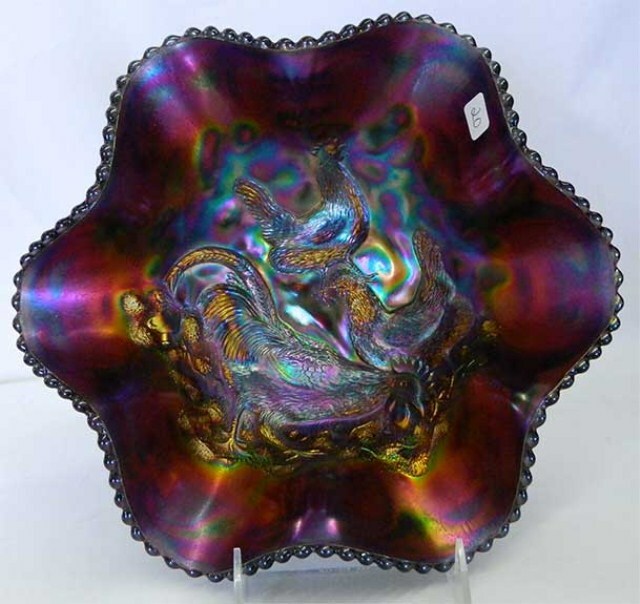 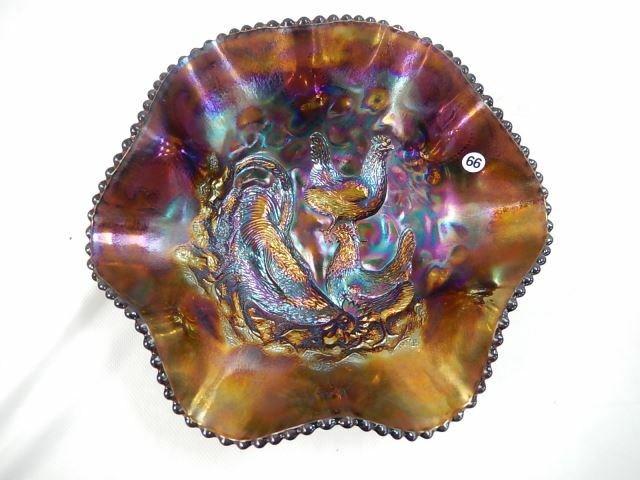 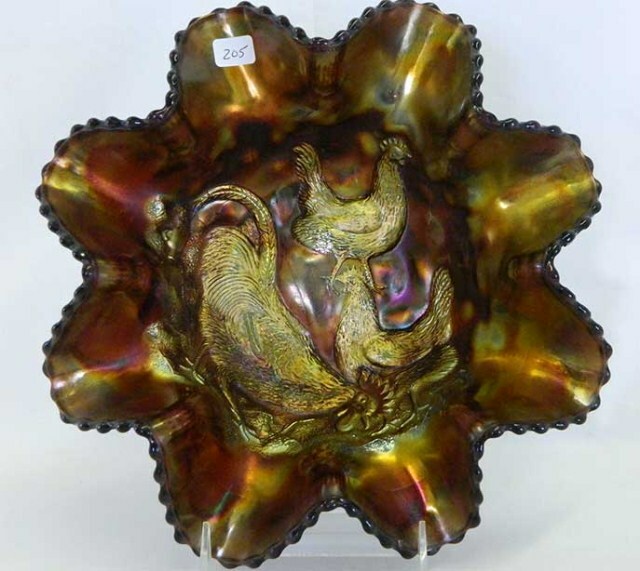 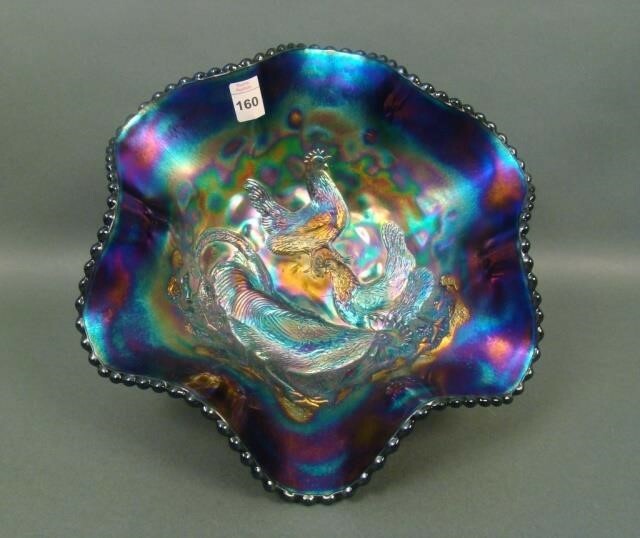 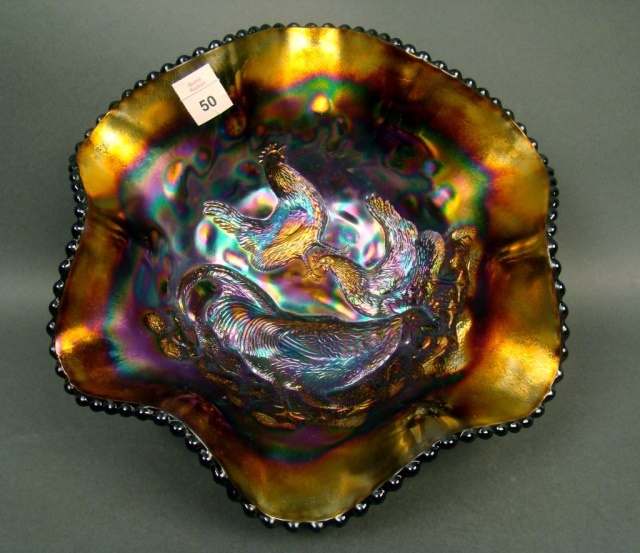 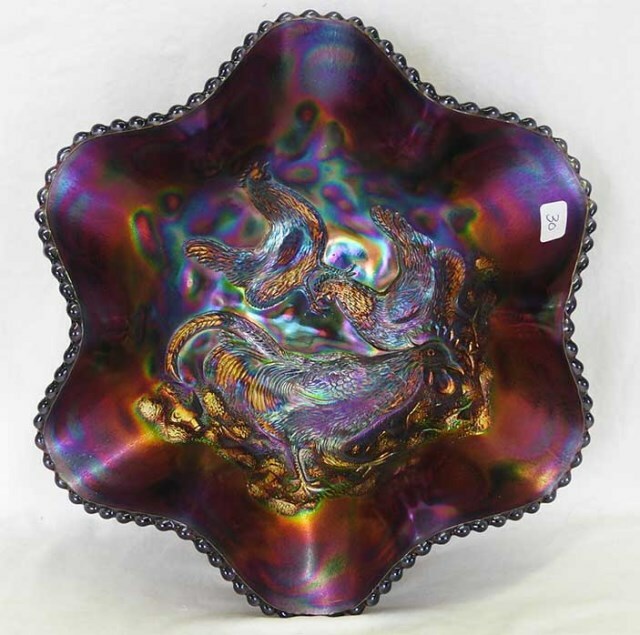 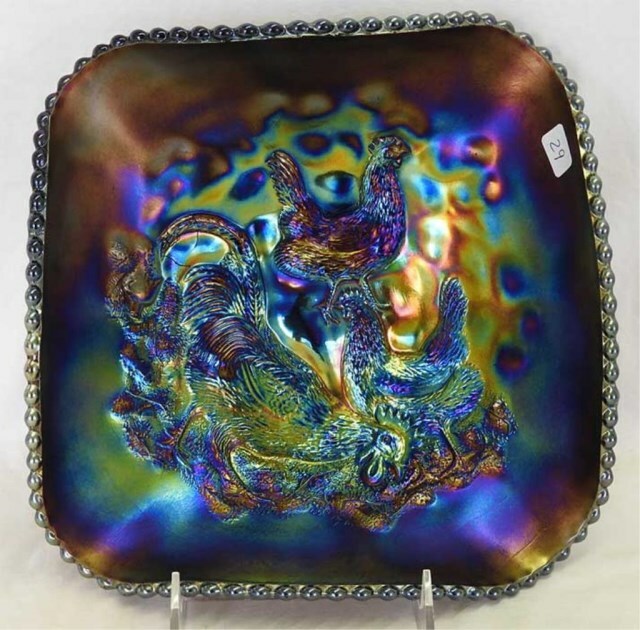 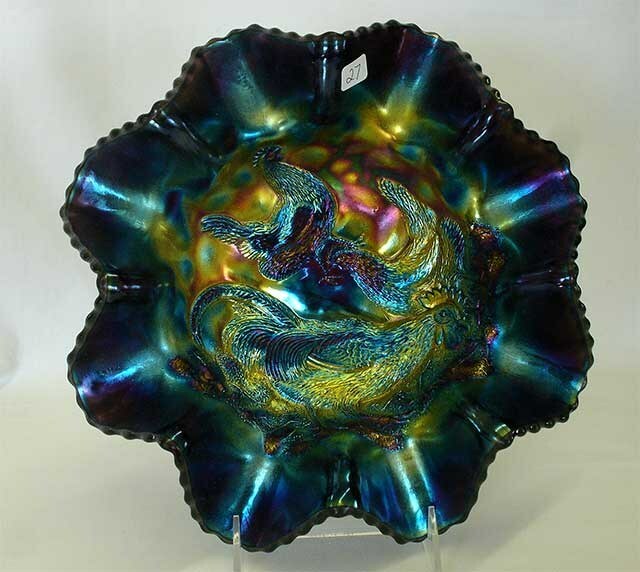 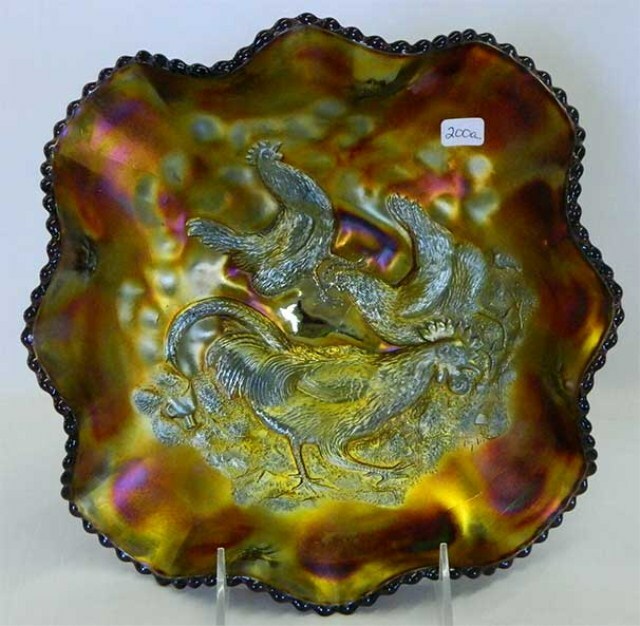 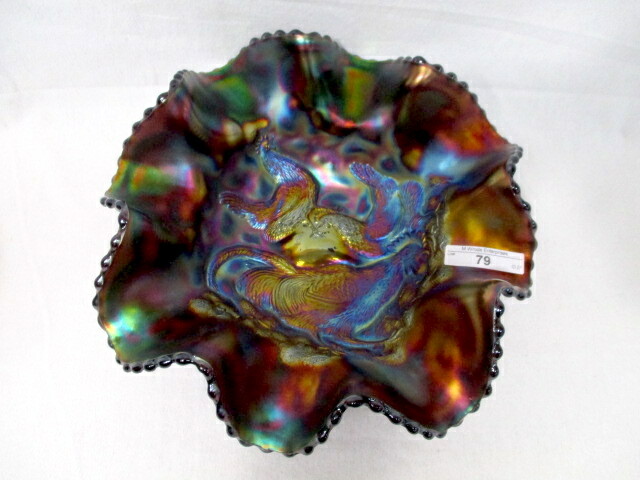 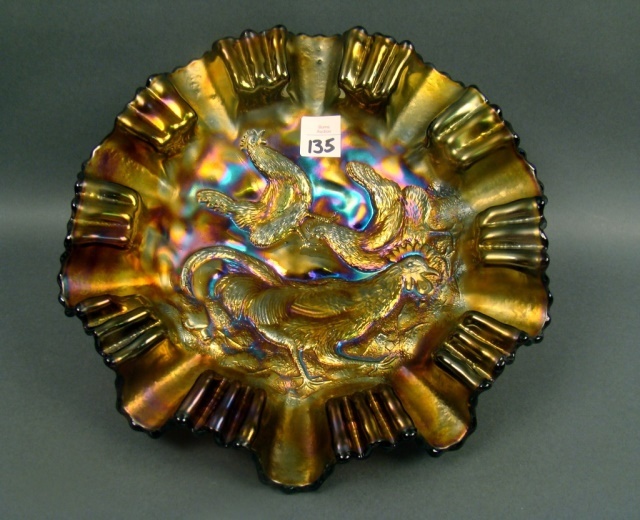 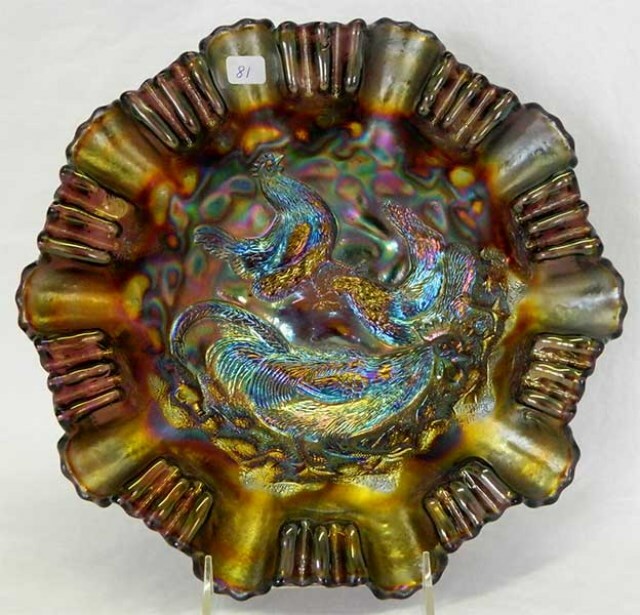 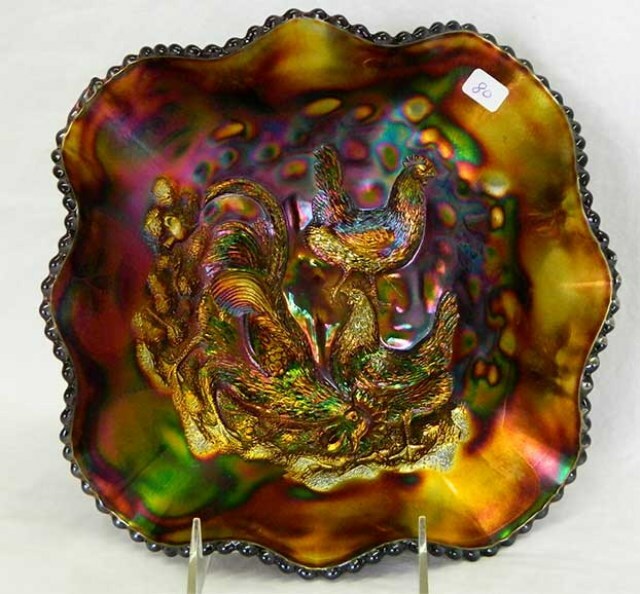 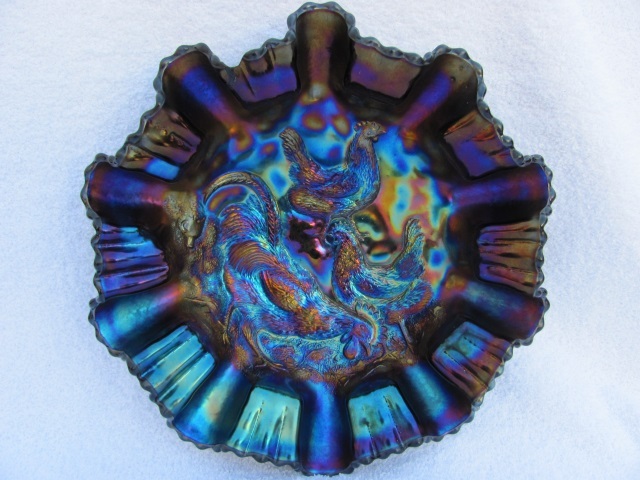 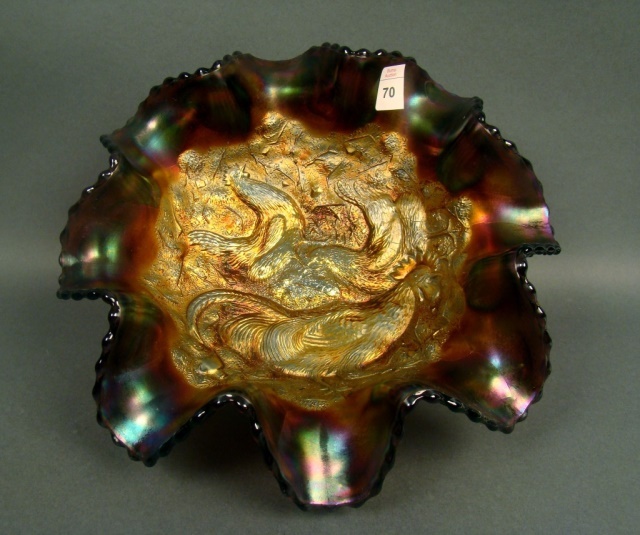 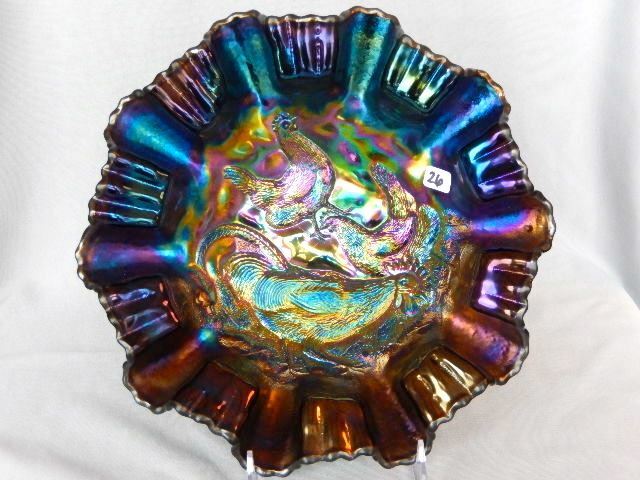 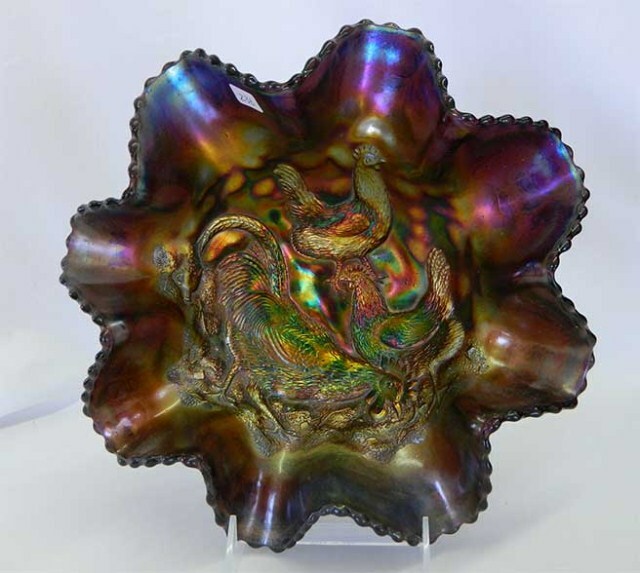 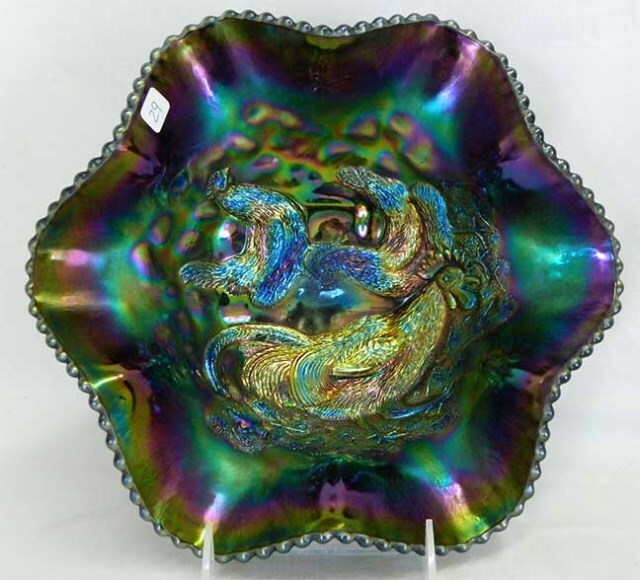 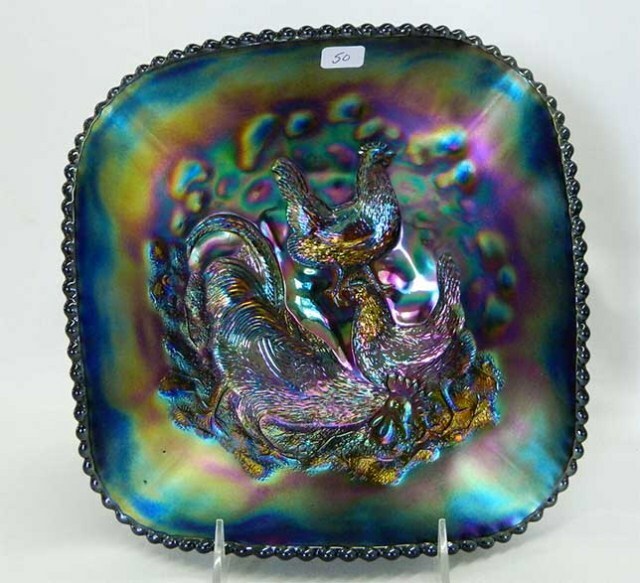 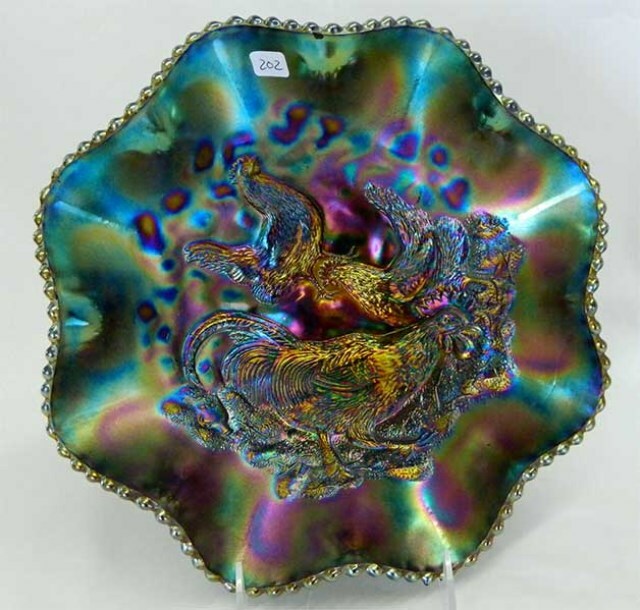 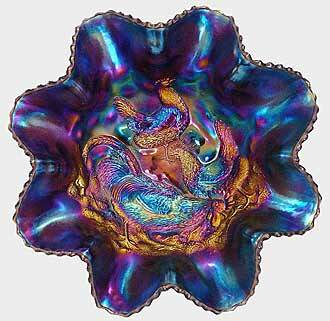 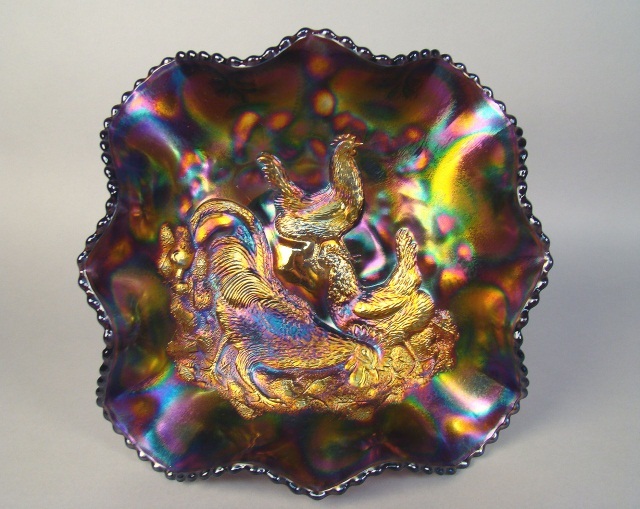 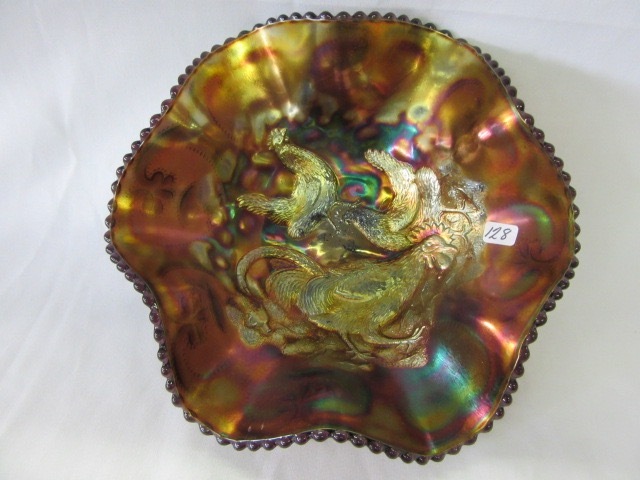 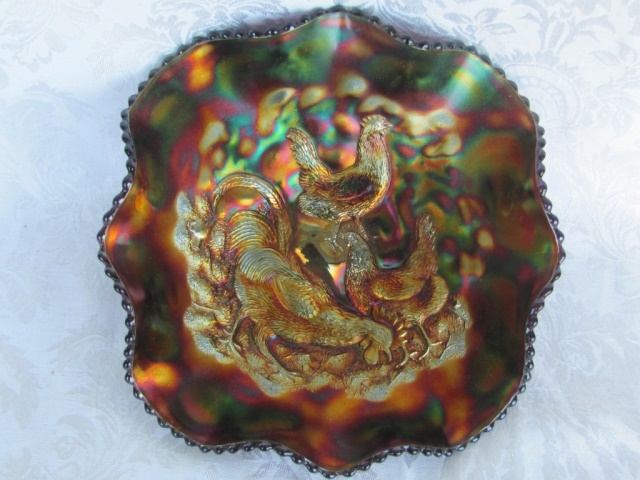 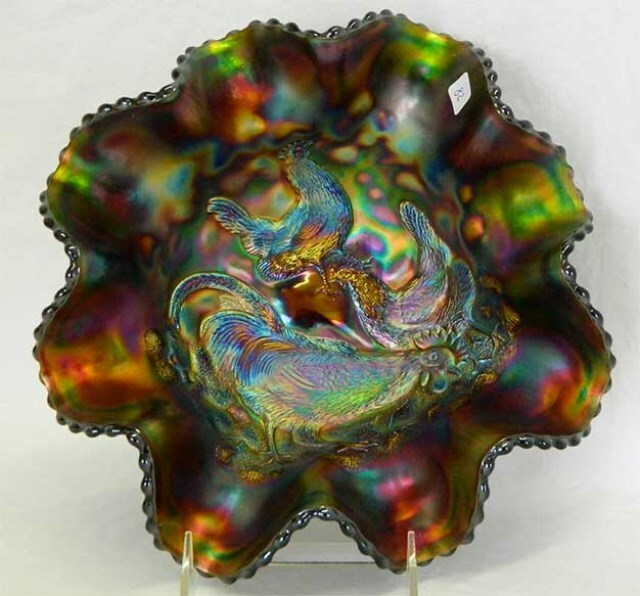 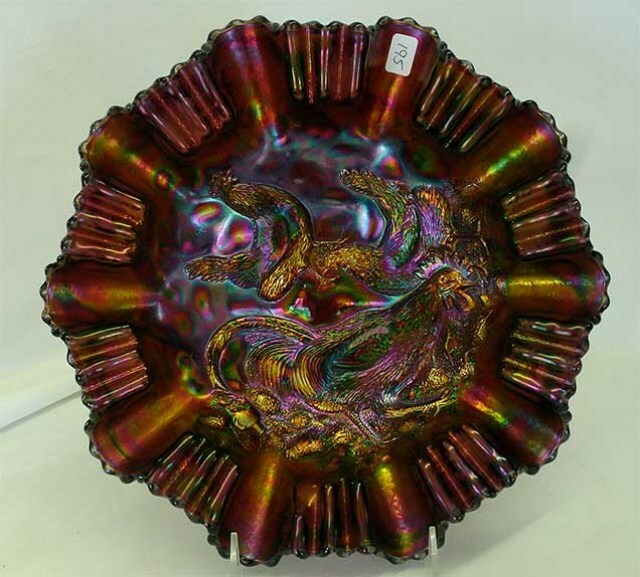 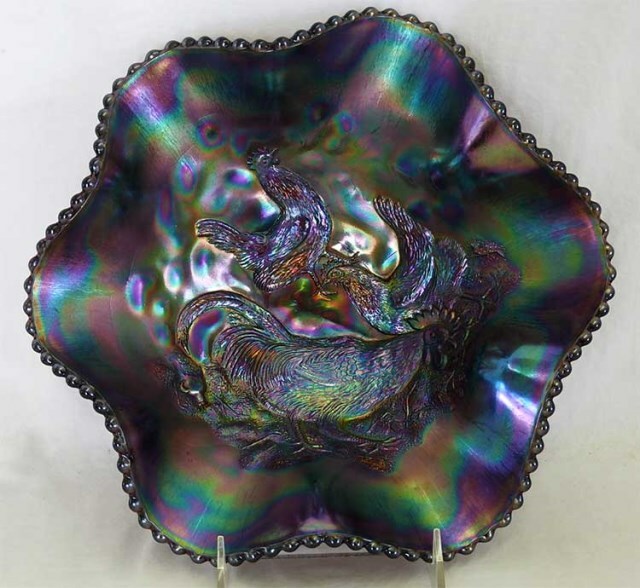 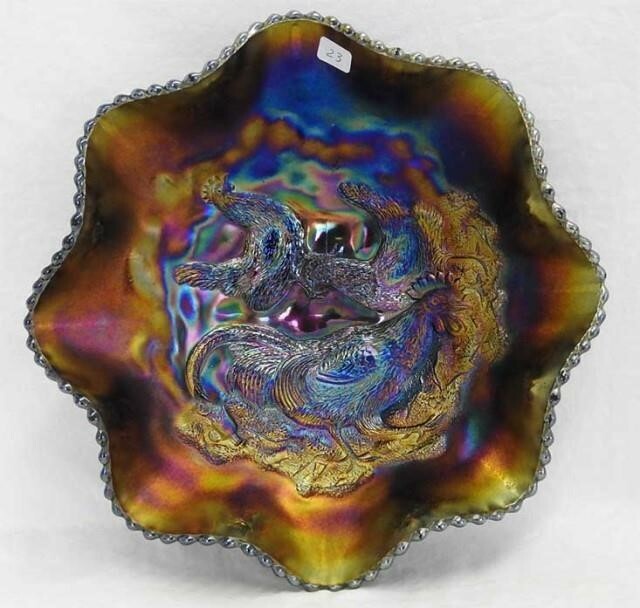 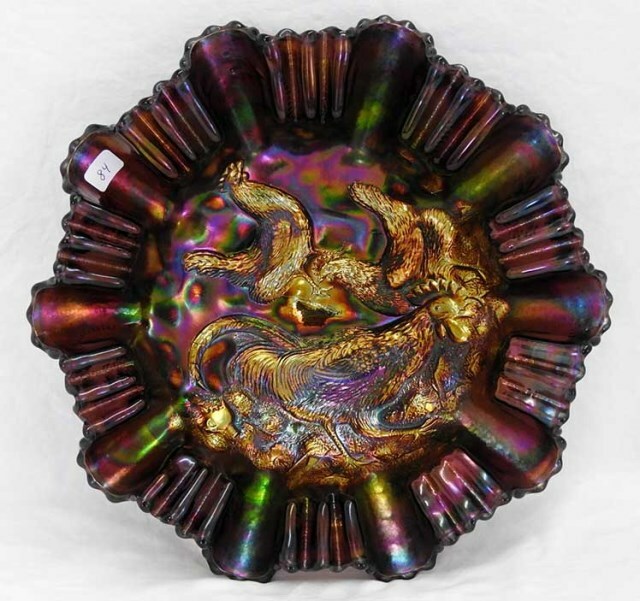 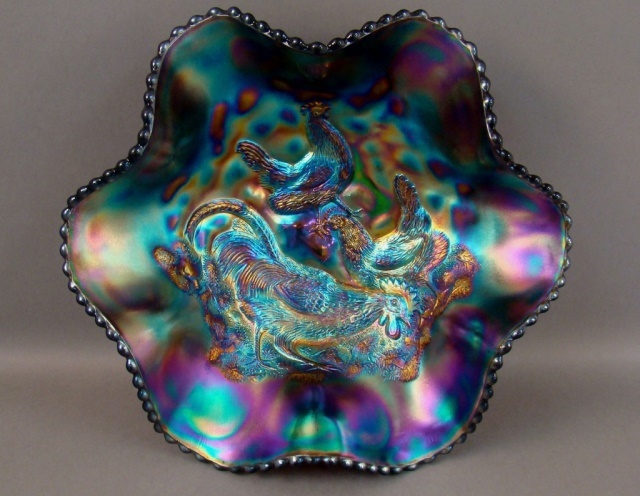 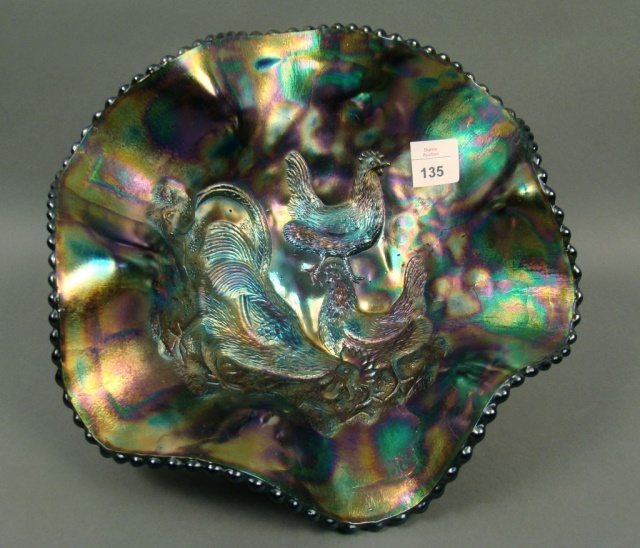 Pictured on the right is an eight-ruffled bowl in purple with blue iridescence. 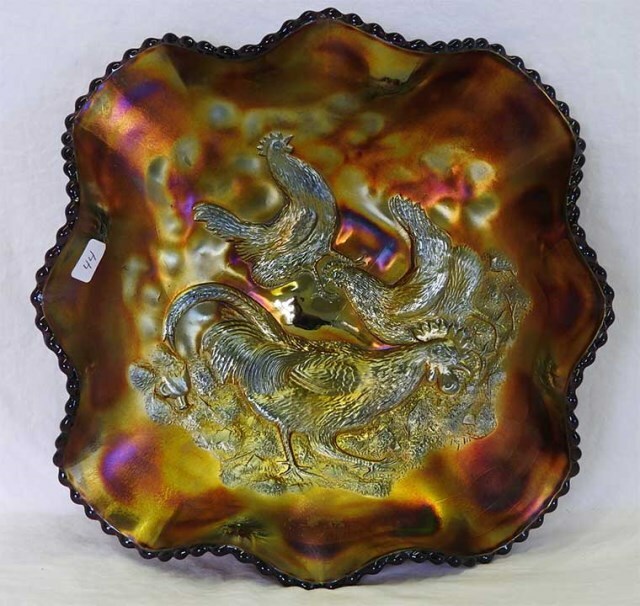 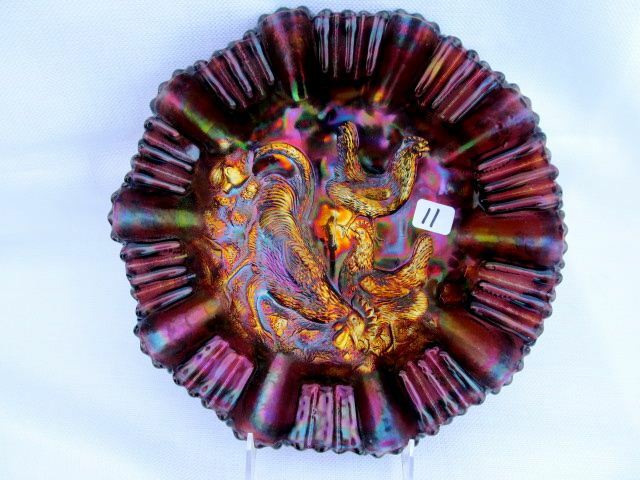 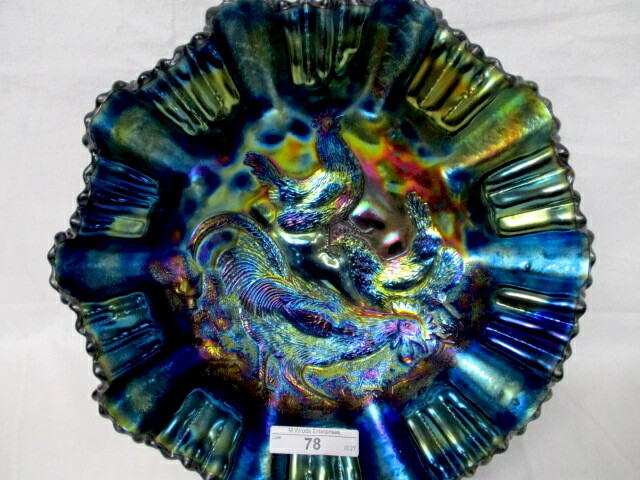 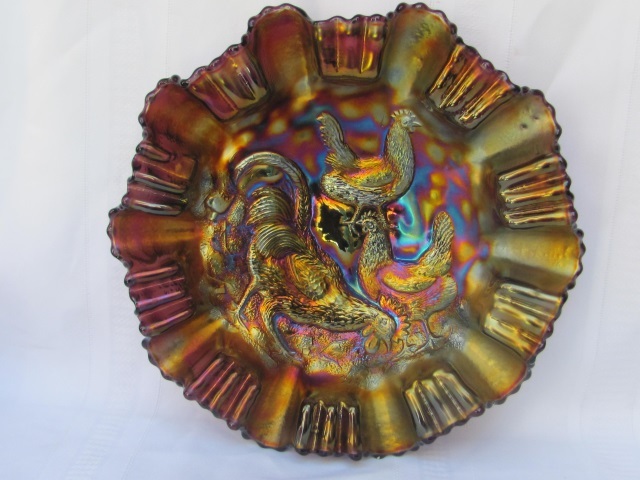 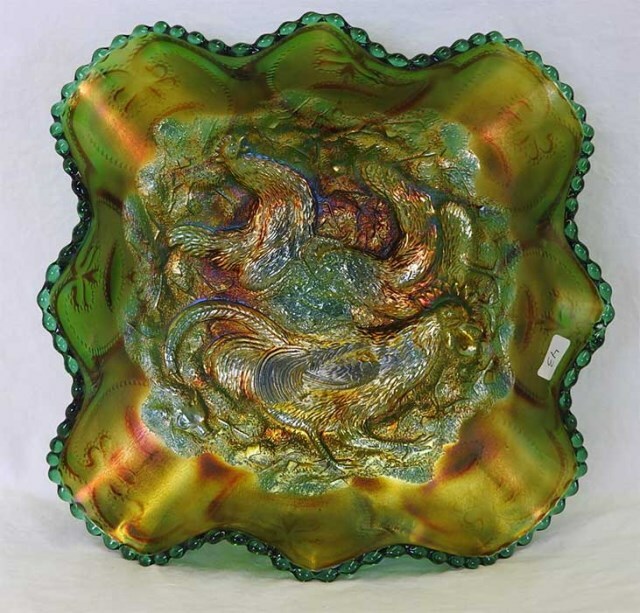 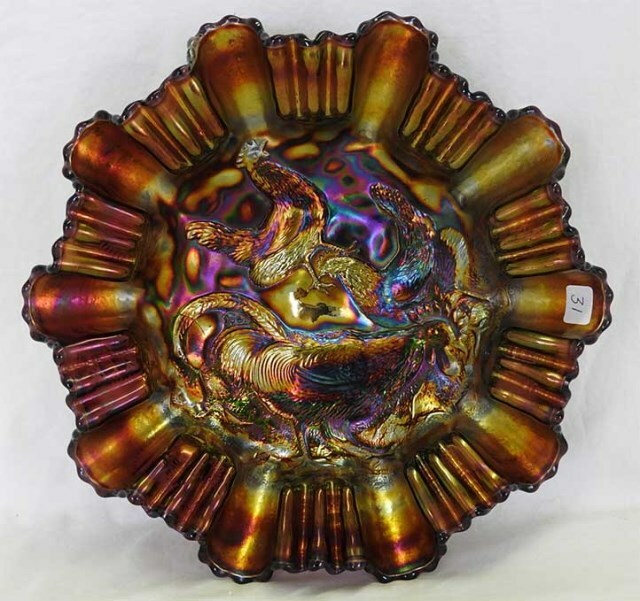 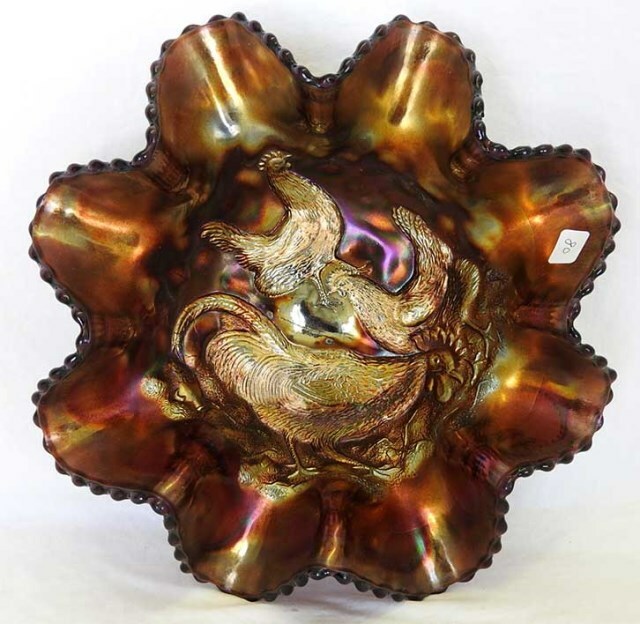 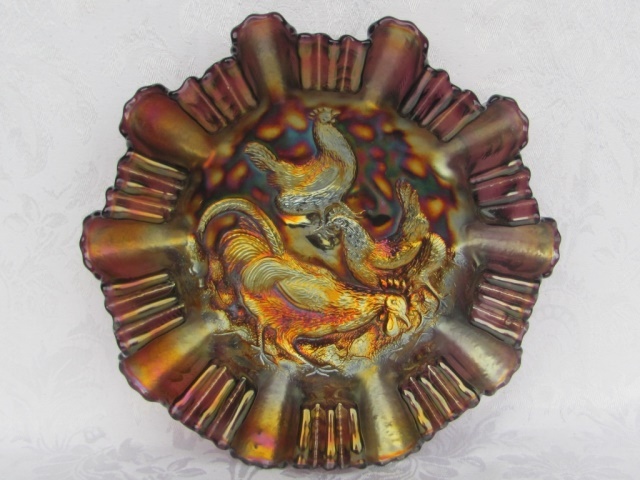 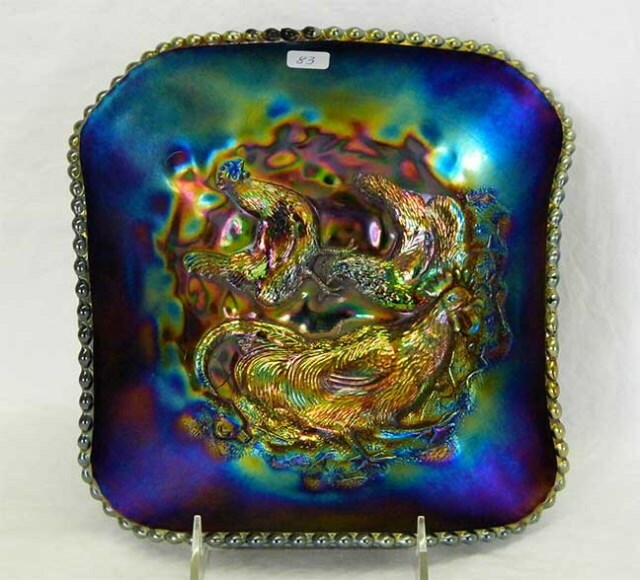 Sold for $19,000 at 2011 International Carnival Glass convention auction. 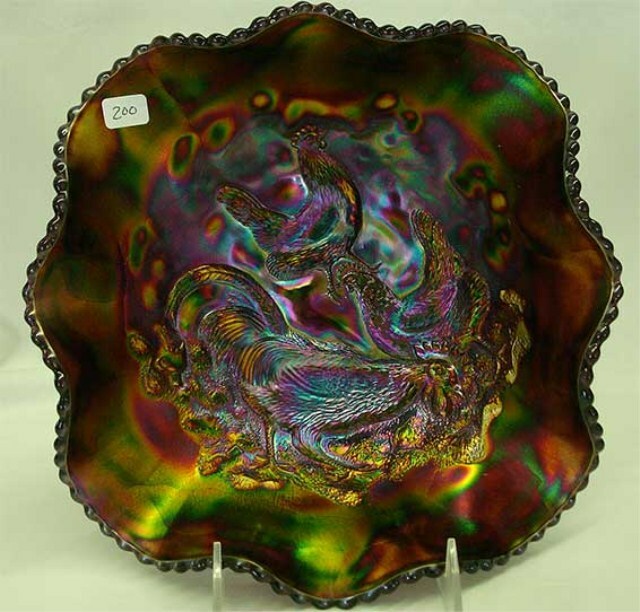 Photos courtesy of Seeck Auctions. 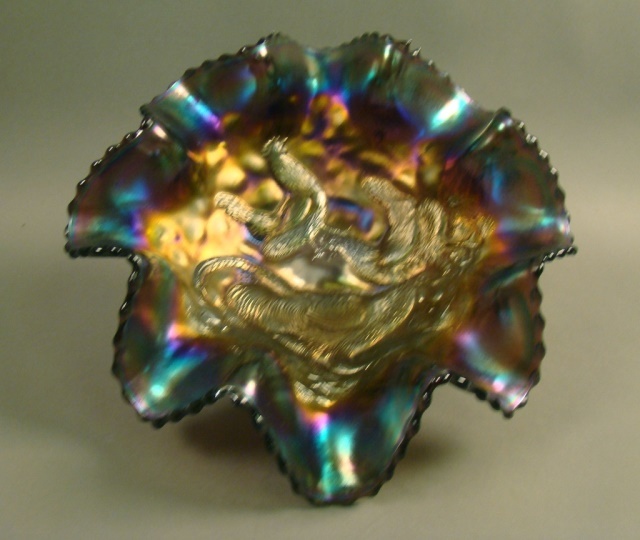 Eight bowls in one collection. 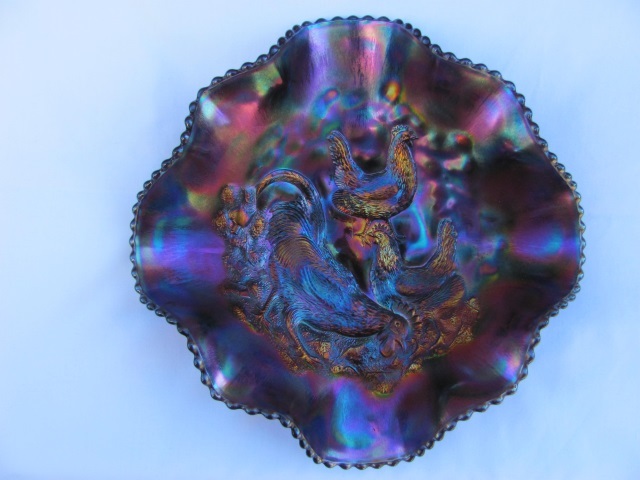 Here is a set of eight Farmyard bowls, each a different shape but all purple, from the collection of Gary Heavin. 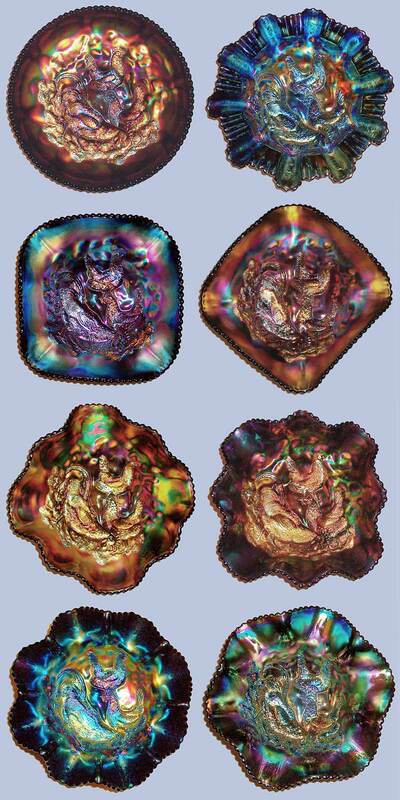 They include (top from left) the only known round bowl (almost low enough to be a plate), a three-in-one edge bowl, a square bowl, a diamond shaped bowl, a diamond ruffled, a square ruffled, an eight-ruffled, and a six-ruffled. 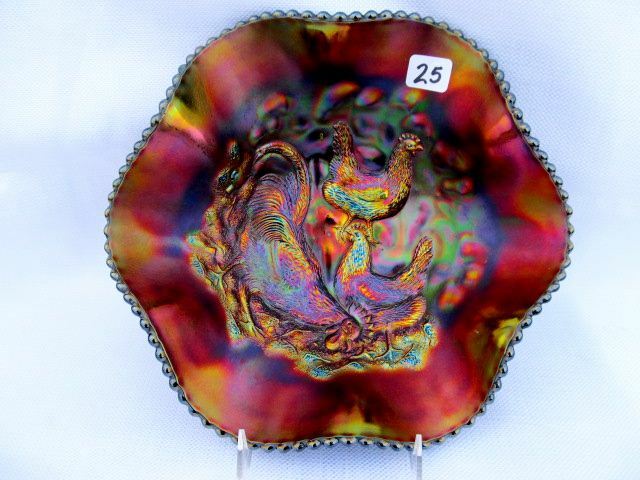 Thanks to Gary for the photographs.